Figure 4. Bożejewice 22/23, Kuyavia. An LBK house superimposed by a house of the Brześć Kujawski culture (after Czerniak 1998: 27). On the Polish Lowland even more spectacular finds were made in recent years as commemoration practices can be dated to nearly a millennium after the LBK. The location of long houses belonging to these first farmers in Kuyavia must have still been visible as low mounds and respected by people of the so called Brześć Kujawski culture, dated to c. 4600-3900 cal BC. The question of cultural and demographic continuity between these two cultures has been hotly debated and is still very controversial. Both cultures belong to the tradition of “Danubian” long houses, but there definitely is no chronological and technological continuity in their architecture. They are divided by a post-LBK period (with influences of the Stroke Band Pottery culture) without any similar permanent occupation traces. The most astonishing example of the seeming remembrance relationship comes from Bożejewice 22/23, where an LBK long house, dated to c. 5300 cal BC is superimposed by a typical trapezoidal Brześć Kujawski (BKC) structure, about 1000 years later (Czerniak 1998, Midgley 2006; Figure 4). The later house follows the axis of the older so precisely that we have to come to the conclusion that their relationship was intentional and not accidental. This is not the only site that displays this practice, although it is an exceptionally well preserved example. At the sites of Brześć Kujawski 3 and Smólsk 4, postholes of LBK houses were not preserved any more, however, the typical external elongated pits, located usually along the N-S walls of the buildings clearly indicate the presence and exact location of such structures. In both cases Brześć Kujawski trapezoidal houses were superimposed on them, in exactly the same way as Bożejewice 22/23 (Grygiel 2008). Of course not every LBK house was treated in this way. These are exceptional finds. In general the former, large LBK sites were intentionally avoided by Brześć Kujawski people, even though the settlement location preferences were practically identical for both cultures. Brześć Kujawski people often settled in the vicinity of these older habitations and must have been absolutely aware of the presence of the older sites. An example comes from the microregion of Ludwinowo near Włocławek in eastern Kuyavia, where both LBK and Brześć Kujawski sites were excavated in in advance of motorway construction. The site Ludwinowo 7 is the largest LBK settlement in this area, consisting of at least 25 houses covering the whole time span of this culture (Pyzel 2012). A large Brześć Kujawski settlement, Ludwinowo 3 is located only 400 metres to the west (Marchelak et al. 2012). Single pits of the LBK were uncovered there as well, and at other, smaller neighbouring sites, structures of both cultures were found, but at Ludwinowo 7 no traces of permanent occupation of the Brześć Kujawski culture could be found. There are only traces of individualistic ritual activities such as event that place items into the older LBK pits (Czerniak, Czebreszuk 2010). 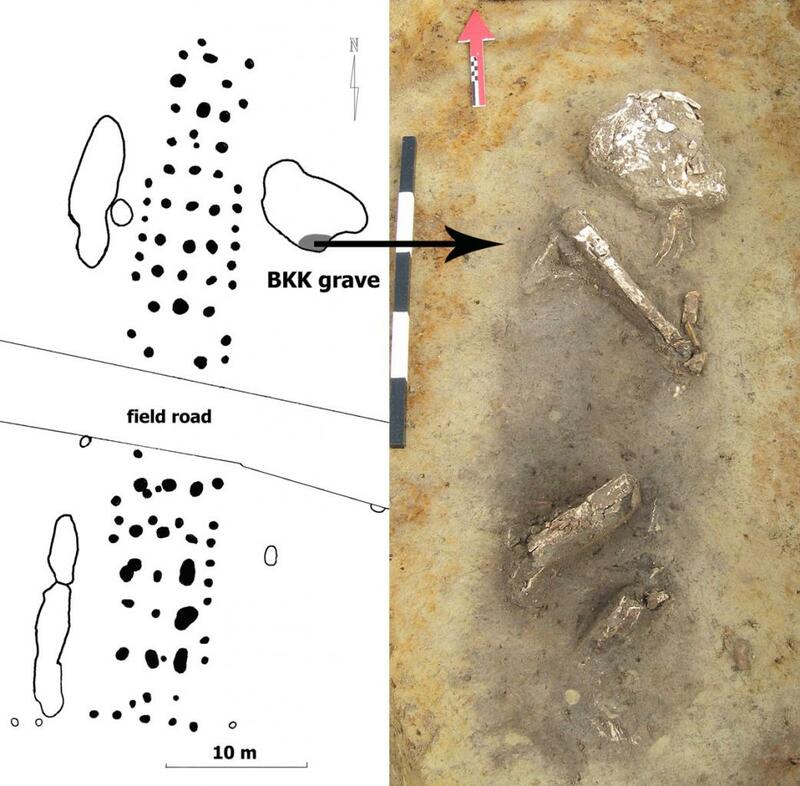 A grave dated to about 4380 cal BC – of the Brześć Kujawski culture – was also inserted into an earlier pit associated to the longest LBK house at this site (Czerniak, Pyzel in print; Figure 5). Figure 5. Ludwinowo 7, Kuyavia. A grave of the Brześć Kujawski culture dug in a pit connected with an older LBK house (after Czerniak, Pyzel in print). Brześć Kujawski people seem to have acknowledged the presence not only of LBK houses but also older houses of their own predecessors (Pyzel 2013). Unfortunately the precise dating of buildings from this period is not as easy as it was for the LBK – there are few pits associated with them and the pottery, mostly found, does not allow such precision. This explains why internal occupation histories of Brześć Kujawski sites are quite general. Nevertheless on some sites it is possible to find superimposed buildings indicating similar practices. Houses in the Brześć Kujawski culture were even more standardised but these differing treatments demonstrate that they did not have the same meaning in the society. Maybe some of them were a kind of origin houses known from ethnographic sources (e.g. Waterson 2000). Some people may have chosen to build within the older LBK houses to further enhance this function and thereby legitimise their ancient origin (and privileges that must be associated with this). There can be no doubt that the past, even a remote one, played an important role in the Brześć Kujawski societies. Leaving aside the question of this relationship to LBK ancestors representing a genuine continuity or an invented tradition, these commemoration practices demonstrate to us how long these abandoned buildings of first farmers could have been visible in the otherwise unchanged landscape of prehistoric Europe and what this must have meant to those that came after. This is a modified version of a paper presented in a session “Understanding monumentality: motivations, mentality and the significance of early monuments for past societies“ of the 7th World Archaeological Congress in Jordan in January 2013. I would like to thank the organiser of the session Bettina Schultz Paulsson, the scientific committee of the WAC and the WAC Travel Funding Committee for the possibility of presenting it and attending. -Czerniak, Lech. “The First Farmers: Najstarsi rolnicy.” In Pipeline of archaeological treasures: Gazociąg pełen skarbów archeologicznych, ed. Marek Chłodnicki, and Lech Krzyżaniak, 23–36. Poznań: Poznańskie Towarzystwo Prehistoryczne, 1998. -Czerniak, Lech, and Janusz Czebreszuk. “Naczynie zoomorficzne z Ludwinowa, stanowisko 7, woj. kujawsko-pomorskie.” Fontes Archaeologici Posnanienses 46 (2010): 127–35. -Czerniak, Lech, and Pyzel Joanna. “Unusual Funerary Practices in the Brześć Kujawski Culture in the Polish Lowland” In Irreguläre’ Bestattungen in der Urgeschichte. Norm, Ritual, Strafe …?, ed. Nils Müller-Scheeßel, Bonn: Habelt, Kolloquien zur Vor- und Frühgeschichte, in print. -Grygiel, Ryszard. Neolit i początki epoki brązu w rejonie Brześcia Kujawskiego i Osłonek: Tom II. Środkowy neolit. Grupa brzesko-kujawska kultury lendzielskiej. Łódź: Fundacja Badań Archeologicznych Imienia Profesora Konrada Jażdżewskiego; Muzeum Archeologiczne i Etnograficzne w Łodzi: Wydawnictwo Fundacji Badań Archeologicznych Imienia Profesora Konrada Jażdżewskiego, 2008. -Lüning, Jens, Schwanfeldstudien zur ältesten Bandkeramik. Bonn: Habelt, 2011. -Marchelak, Ireneusz, Anna Nierychlewska, and Iwona Nowak. “Badania ratownicze na stanowisku 3 w Ludwinowie, gm. Włocławek, woj. kujawsko-pomorskie, w latach 2007-2008.” In Raport 2007-2008.: Tom I, ed. Sławomir Kadrow, 85–108. Warszawa 2012. -Midgley, Magdalena. 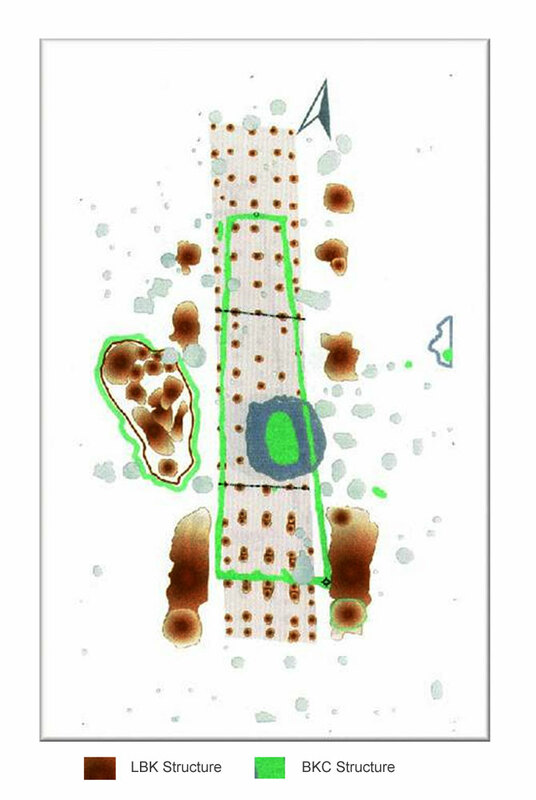 “From Ancestral Village to Monumental Cemetery: The Creation of Monumental Neolithic Cemeteries.” www.jungsteinsite.de (2006). -Pyzel, Joanna. “Preliminary results of large scale emergency excavations in Ludwinowo 7, comm. Włocławek.” In Siedlungsstruktur und Kulturwandel in der Bandkeramik: Beiträge der internationalen Tagung “Neue Fragen zur Bandkeramik oder alles beim Alten? !”, Leipzig, 23. bis 24. September 2010, ed. Sabine Wolfram, and Harald Stäuble, 160–166. Dresden: Landesamt für Archäologie, 2012. -Pyzel, Joanna. “Change and Continuity in the Danubian Longhouses of Lowland Poland.” In Tracking the Neolithic House in Europe: Sedentism, Architecture and Practice, ed. Daniela Hofmann, and Jessica Smyth, 183–196. New York, NY: Springer, 2013. -Veit, Ulrich. Studien zum Problem der Siedlungsbestattung im europäischen Neolithikum. Tübinger Schriften zur Ur- und Frühgeschichtlichen Archäologie. Vol. 1. Münster: Waxmann, 1996. -Waterson, Roxana. “House, Place and Memory in Tana Toraja (Inonesia).” In Beyond kinship: Social and material reproduction in house societies, ed. Rosemary A. Joyce, and Susan D. Gillespie, 177–188. Philadelphia, Pa.: Univ. of Pennsylvania Press, 2000.